It is important to have a motivation definition that is personal to you in order to fully understand its power and apply it to your own situation. Only by doing this can you be empowered to take action. -	what causes or stimulates a person to act. I like these definitions because in all of them there is a verb or a “doing” involved. Motivation is only motivation if it gets you to take action. Taking action is what separates the losers from the winners and what determines of your motivation definition is effective. Taking action is the difference between wishing and dreaming. Dreamers act. Wishers…well…they just wish their lives away hoping some fairy or genie will drop by and grant their three wishes. Problem is even if the genie or fairy does show up they likely won’t know what they really want. dWhat gets one person motivated may not work for someone else. Having a luxury car may work for one, but for another making a difference in other people’s lives may be their biggest desire. You must have a motivation that makes sense to you - you must decide what your personal motivation is. You must know what your own values and principles are. What really gets you excited? What makes you feel good about yourself? What are your spiritual guidelines? What is it you want? What do you feel is the purpose for your being here? You see, motivation is personal. This is important, because if you don’t you will likely get discouraged along the way. When the going gets tough you will give up the stuff if you are not clear on what drives you, what your motivation definition is. The uniqueness of man is an undisputed fact. There are six billion or so people on this planet and not one of them has your finger prints. Now think about this if that boggles your mind – if you took all the people that ever lived from the creation of the universe, none of them would share your finger prints! That’s how unique you are. That alone makes you special and there are thousands of features that are unique to you alone. You are one of a kind. So why shouldn’t you have your own dream and your own vision for what you want to be? Why shouldn’t you do something that’s never been done before? You have experiences, thoughts, learning and life events that are unique to you. Your talents and gifts are different in nature to other people. So you can be unique in what you want to. At the very least, you should be able to make the choices and decisions about what you want in life. If your motivation definition is personal and relevant to you, it will compel you to take action. If it does not then you haven’t found the right motivation. Keep searching. Look deep within yourself. If you find it, you will act. No man that ever truly discovered his “purpose” for living ever died without at least trying to achieve that purpose. Motivation then is deeply tied to your goals. Your goals are in a true sense your motivation. That is why they are personal. Your goals in life truly define who you are. That is why you need to dream big. Set huge goals. Small goals rarely get people to act. 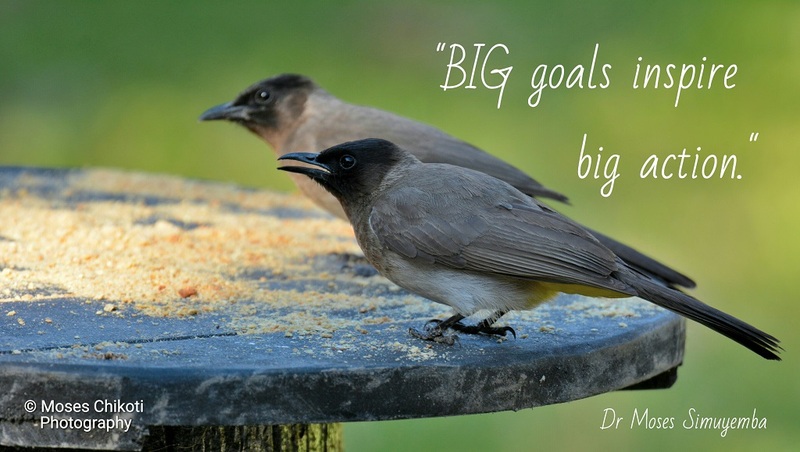 Big goals spur people to action. They are worth the risk. They are worth the effort. Who wants to slave away for mediocrity? If your goal is big enough, the motivation will match the goal. So go ahead - do t.